Eggnog always graced its presence in my family’s house growing up around the holidays, but to be honest, its eggy, boozy allure never really caught my interest. 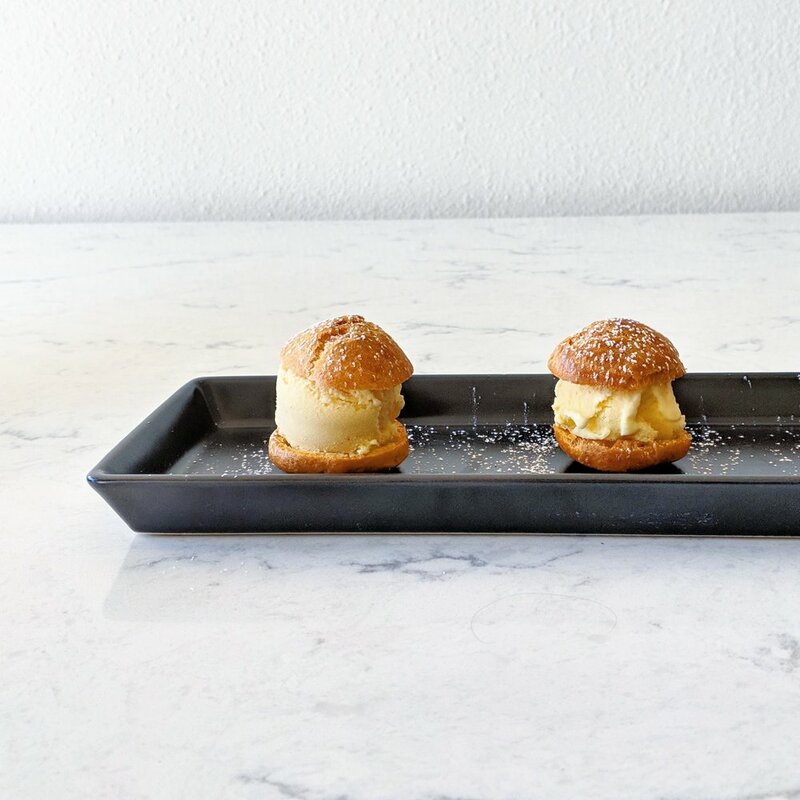 However, eggnog magically contains all the necessary ingredients for making ice cream, so for this week’s Sundae Sunday, I’m going all in on egginess by combining eggnog ice cream with egg-rich choux pastries. This is by far the most straightforward ice cream recipe to date on Hayes in the Fog, and with everyone feeling time-crunched during the holidays, it feels appropriate to share something that will save you a few. If you want to make the ice cream base from scratch (spoiler alert: I use pre-made eggnog here), I recommend you check out Alton Brown’s recipe; sometimes (read as: for this sundae), I’m okay with taking shortcuts. Were I to make this sundae again, I’d add a small dollop of cranberry preserve underneath the ice cream, just to break up the rich, eggy party just a bit -- but if you like eggnog, you’re going to like these profiteroles, both for the taste and for the ease in which they come together. Before you spin your ice cream: place a baking dish and spatula in the freezer (I use the smaller of these two dishes) so your finished ice cream will go into a chilled container and not melt. Pour cold mixture into your ice cream machine, and follow the instructions for your ice cream machine to spin the ice cream. If the machine’s bowl isn’t your final storage container, transfer finished ice cream from the machine to the chilled baking dish and let it set for a few hours. In a saucepan, combine the milk, water, butter, and salt and bring to a boil over medium-high heat. Once boiling and the butter has melted, remove the pan from the heat, add the flour all at once, and stir vigorously with a spatula or wooden spoon until blended. Return the pan to medium heat and continue stirring until the mixture leaves the sides of the pan and forms a ball; it might also form a thin skin on the bottom of the pan. on medium speed until the bottom of the bowl is warm to the touch and the steam coming out of the bowl has dissipated, about 2 minutes. Add 1 egg to the dough and beat on medium or medium-high speed until incorporated. Add the remaining 3 eggs one at a time. After each egg is added, the mixture will separate and appear shiny, but it will return to a smooth paste with continued beating. Occasionally scrape down the sides and bottom of the bowl with a rubber spatula. To check for doneness after 4 eggs, take the paddle of the mixer, dip it in the batter, and lift it up. It should be glossy and stream down in a V-shape from the paddle back in the bowl. If it’s very stiff, add 1 more egg. Line two baking sheets with parchment paper. Fit a pastry bag with a plain or star tip and fill the bag with the paste. Pipe out small mounds, spaced 1 to 2 inches apart. 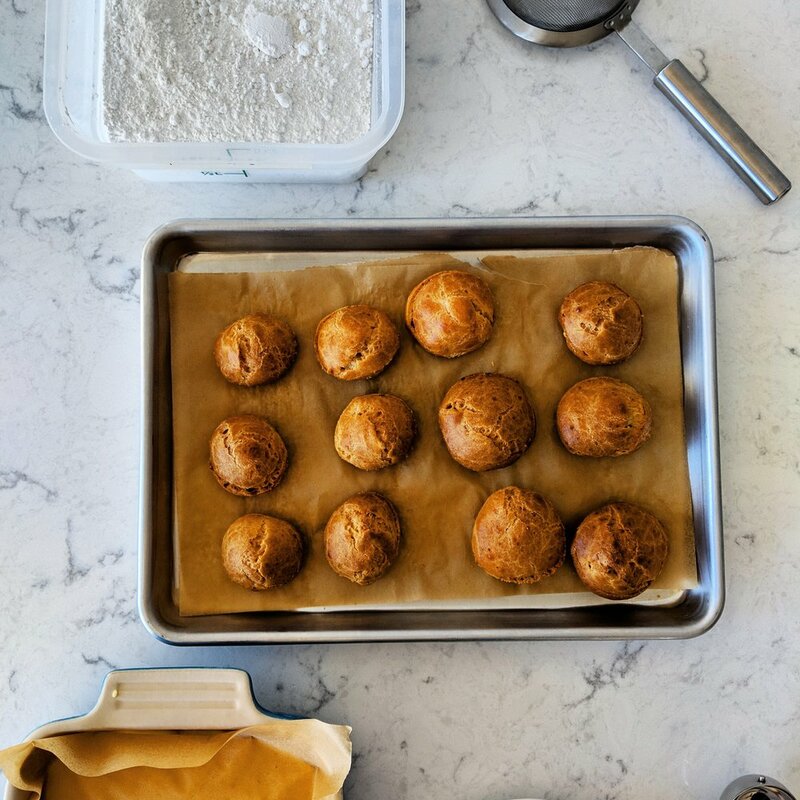 Bake the puffs for 15 minutes at 425°F, then reduce the heat to 375°F and continue baking until golden brown, 15–20 minutes. Either in the oven with the door open or out of the oven, let the choux continue to dry out on the pans. Finish cooling on a cooling rack. Cut each choux in half horizontally so it resembles a hamburger bun, with the bottom half being slightly smaller than the top half. Using a small cookie scooper, scoop 1 scoop of eggnog ice cream per profiterole. 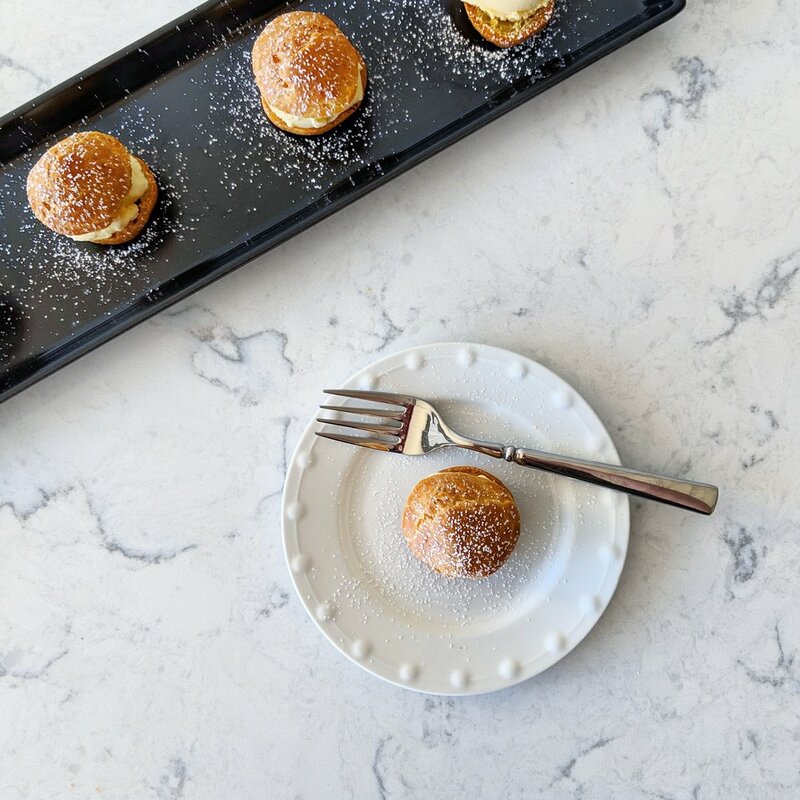 Once plated, dust with powdered sugar and (optional) grated nutmeg; serve immediately. Drizzle the top with salted caramel, spiked with more bourbon of course. Swap in a different alcohol, or omit alcohol entirely from the ice cream base. Add a ginger craquelin topping to the choux for added texture.